Recently, I spent a week at Kanuga immersed in painting (some would say writing) my very first icon. I went into the experience not knowing what to expect and not really being sure whether or not I even liked icons. I have a few and I cannot say they ever spoke to me in a very deep way. What attracted me to the workshop was an opportunity to do something concrete that nonetheless spoke to my soul. We began with a board prepared with gesso—twelve layers of it in fact! It was completely white and as the instructor said, represented chaos out of which we were going to bring order. To be more accurate, she said God working through our hands would bring the order. The first step was transferring the image to the board and then etching that image into the gesso. After that, we added layer after layer of egg tempura paint, gold leaf and at times India ink. The entire process was immersed in prayer. Holy Eucharist was celebrated every morning and the day ended with Evening prayer. In the studio, we began each work session by sitting quietly with our icon in its various stages and allowing it to speak to us. At times it was quite intense. The icon worked on me as much as I worked on it. My first prayers were simply, “God, help!” Then gradually, I was able to let go of my own directives and began to trust the process itself. As our instructor reminded us, there are no perfect icons but the work is all for the glory of God. Layer after layer, the image emerged and I was able to more deeply enter into the experience. 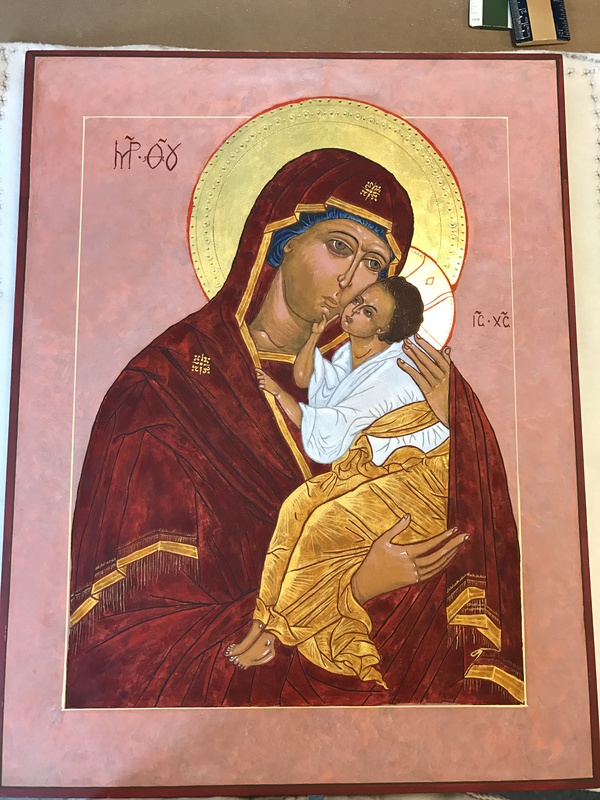 I discovered that painting icons is indeed prayer. It is a conversation with God. And as in all other forms of prayer, when we truly place ourselves before God, we are sometimes challenged and sometimes chastised but always, we are blessed. I give thanks for this opportunity to learn a new way to pray. This is the seventh installment in our Prayer series that will run up to the Diocesan Prayer Vigil in March. Click here to view other stories in the series, and here for more information on the Vigil. This entry was posted in prayer and tagged Canon Martha Ishman, icons, prayer, prayer vigil, St. James. Bookmark the permalink.